The Maze Rattan round bar set is the ultimate in casual luxury. In the centre of the round glass topped table, which sits on an elegant pedestal centre leg with matching round base, is a fully integrated ice bucket. The 6 high seated bar chairs feature a conveniently positioned footrest and have a padded seat cushion and a low backrest with integrated handle to aid manoeuvrability. This elegant round bar set is certain to impress your guests and is the perfect way to relax and enjoy refreshing drinks on those hot summer days. The round synthetic rattan weave is weatherproof and easy to maintain and benefits from a rust resisting aluminium frame as well as a 1 year manufacturer’s warranty. 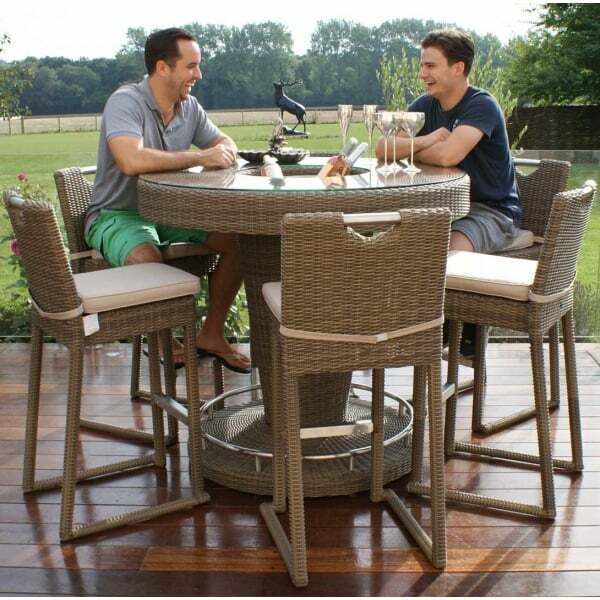 This bar set is part of the extensive Maze Rattan Winchester range and can be used as a stand alone feature or a stunning complimentary piece to dining and sofa sets all of which can be viewed on our site.